Otis College of Art and Design opened its doors in September of 1918. That’s 100 years of dedication to giving an inspiring and transormative arts education experience. To celebrate we’re running the 100% campaign, dedicated to creativity and the 100% commitment that artists and designers give to their passion. It’s about the effort and discovery of who you are and who you can become. 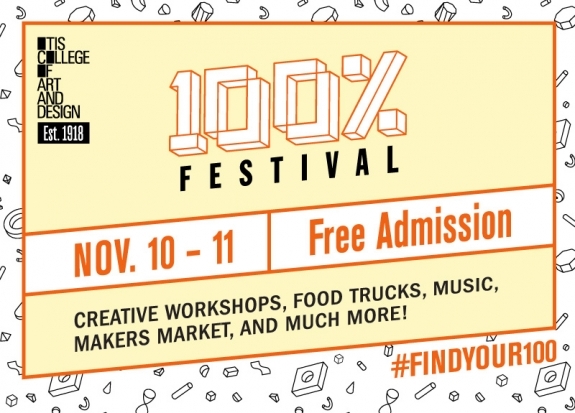 A key event in the campaign, the 100% Festival will take place on November 10 and 11 at Otis College's Los Angeles campus. The 100% Festival will feature a makers market, creative workshops, guest speakers, music, food trucks, and more.